Before I went away for recent my trip to New York City, as a gesture of extraordinary kindness to the person who I swapped apartments with, I cleaned out some of the things in my fridge. Nevertheless, she managed to find my stash of crunchy organic peanut butter, but curiously missed the luscious jar of salted butter caramel from Henri Le Roux in Brittany. What’s up with that? I guess that means there’s another apartment swap in my future! I came back to a spotless refrigerator, but after a few days, I realized there was too much empty space in there, so now it’s back to filling it up again. 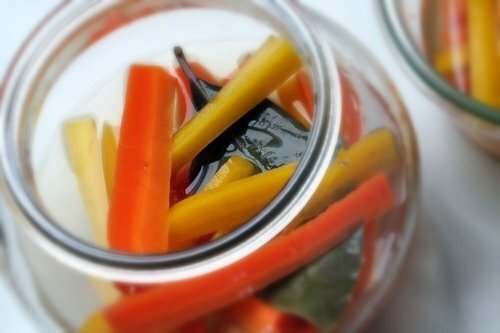 I decided to do some quick pickles with carrots I gathered up at the outdoor market. 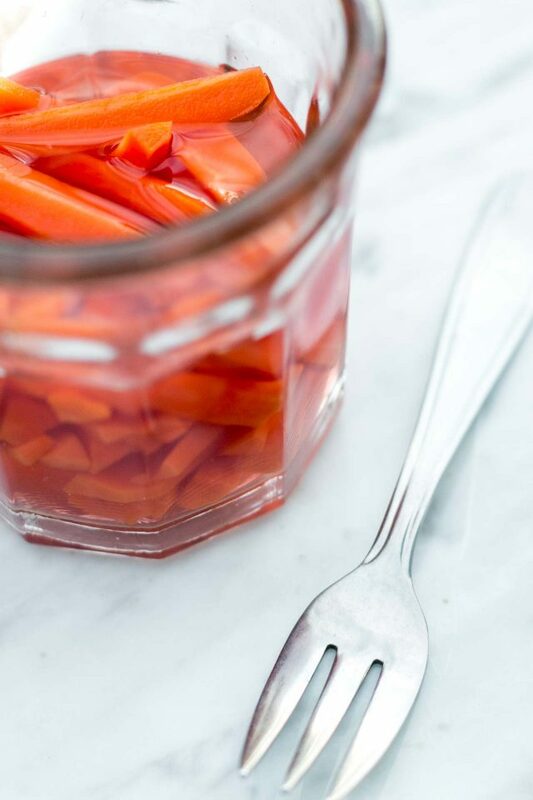 I was planning to make salade de carrots rapée with my handsome root vegetables, I had so many, well…pickles it is, or was. It also gave me an excuse to use some of the vintage jars I bought at a flea market last summer, which were priced at just 50 centimes a piece. Which offset the price of my organic haul. Because these aren’t mean for long-conservation, it was fine to use my French beauties, which give me a thrill every time I dip a spoon, or fork, into them. One nice variation is to add some radish slices to the mix. They look nice and add a little variety to the mix, which some say is the spice of life. Speaking of which, I’ve included some suggestions if you want to spice them up a bit, although they’re delicious just as they are. I’ve never had a pickled carrot but I’m a big fan of pickled beets. Lots of beets to be found here in Paris but nary one that’s pickled. 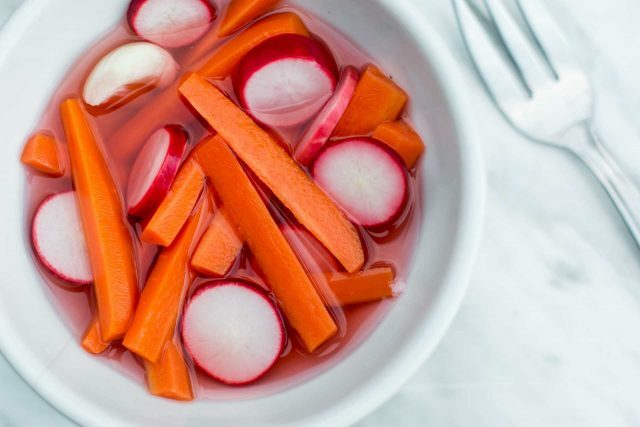 Do you think this recipe would work well with beets? Anne: Yes, although be prepared for some red juices! Apparently it also works well with green beans, too. Ooh, I have been suffering from a glut of carrots from the weekly vegetable delivery and now I know what to do with them. I don’t suppose it would make parsnips palatable too…? Thanks David – inspiring as usual!! Haven’t had pickled carrots any way except for spicy Mexican style. These sound like a nice diversion from more of the same. When it comes to the difference between the anise and fennel seeds — they’re not the same. Across the pond, we often get fennel seeds even though they’re labeled anise…which is strange. I never considered using a multi-color array but my, it looks refreshing and cheery. Great for a cocktail buffet! How on Earth could anyone pass up the jar of Le Roux C.B.S.??? I’m drooling at the thought of it. When I was in Paris last May, Denise was out of the jars of Caramel Beurre Sale, so she special ordered one for me to arrive the day before we were to depart. Unfortunately, our schedule was too tight, and we never made it back to her shop, which I deeply lamented. Though, I have no doubts that some lucky person (most likely referred by you, Monsieur David) snatched my jar right up, and delighted in every spoonful. As always, the photographs are simply delectable, David! @ Anne, How strange that you can’t find any pickled beets in Paris! 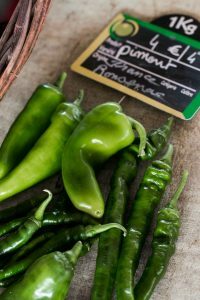 Those are the only ones that I can find in my living in France for over ten years–they come in vacuum-packed plastic packets in the fresh produce department of supermarkets (at least they are in Grenoble). I am craving fresh beets with green tops and seldom do I find them, even at the open-air green markets. I love that the box of cider vinegar says so in Russian. 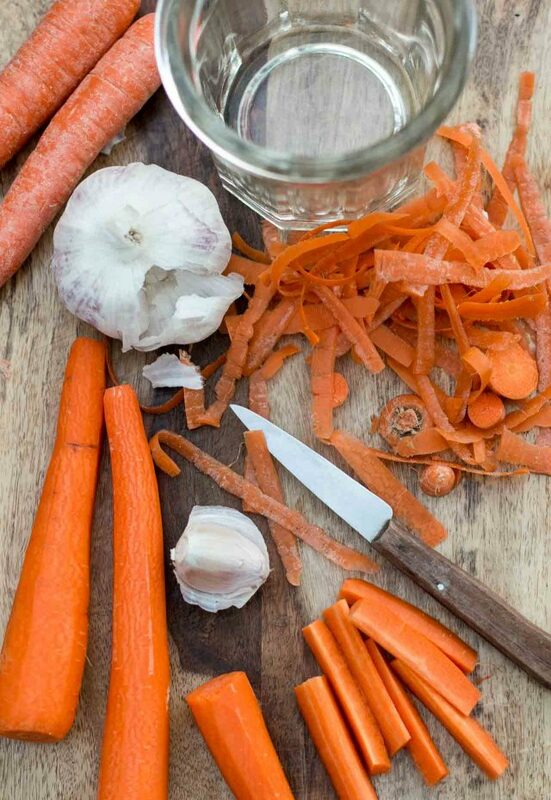 Love love love pickled carrots — or pickled anything for that matter. Those carrots look really good, and some of their local relatives might well end up the same way in my fridge. 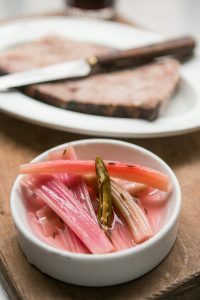 Regarding some comments, it’s true that you don’t find many pickled vegetables in France. Living in Germany, I believe it’s more a central European thing (pickled beets), or Italian. @Michelle: French vacuum packed beets are usually simply cooked beets, they are not pickled. Those you find in Germany also come from France, and are stored with fresh vegetables, whereas pickled beets, very popular in Germany, are with canned vegetables. My husband makes something similar to this recipe. He uses golden beets sometimes, too. Quite yummy! 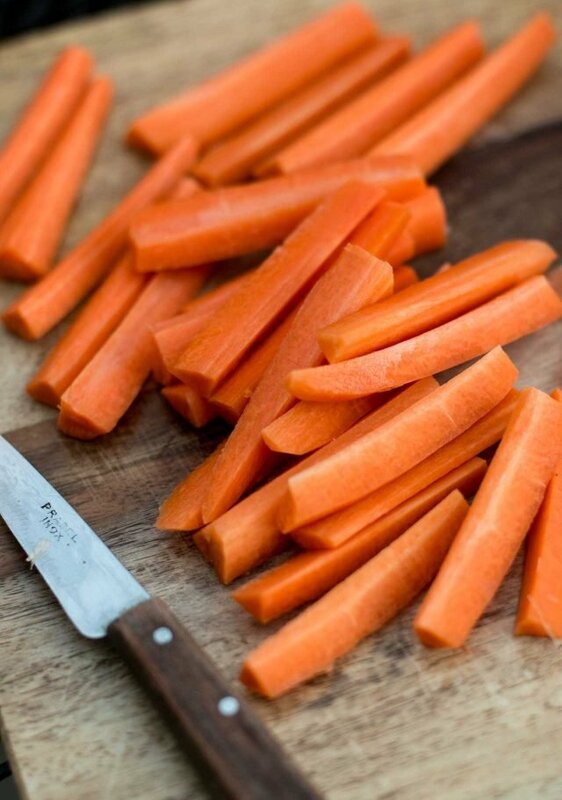 These look great, I always have a bag of carrots in the fridge. I’ve found vacuum packed cooked beets in the supermarket and huge woody cooked beets in the open air markets. I looked desperately last spring for new baby beets with their greens intact and came up empty. eg: Yes, you could use less-salt. I use coarse sea salt, which is less-salty than fine table salt. But still, the amount is variable. However, I would like to know if anyone’s made these using the original proportions of 1 1/2 tablespoons of fennel (or dill) seeds? I tried that, and was blown-away by the flavor and intensity of the seeds…. David, I recall seeing a shop that made Gravlax, perhaps they have dill seed there? I don’t remember the name of the store, but I do know it is on Rue Francois Miron near the cross street of Rue du Pont Louis-Philippe. It will be on the south side of the street. Hope it helps! @ Veronique and Anne, The vacuum packed beets in Grenoble supermarkets are soured beets (on the package, look for vinaigre in the ingredients). I just slice these soured beets and mix them up with sliced onions, toss them in a light olive oil/vinegar dressing, and presto in a hour or so, what you get is essentially pickled beets. To prevent getting woody beets, look for plastic packs of small, non-woody soured beets. Instead of 3 large beets in the package, there are about 7-8 small, tender beets. Yum. 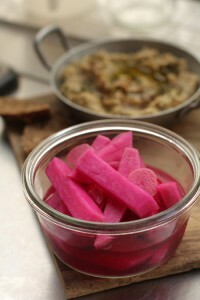 I actually prefer this version of pickled beets than the ones that are truly pickled which are just too puckery for me. As for getting the rather rare fresh beets with green tops, I can find them infrequently at the open air market that specialize in produce grown by small stakeholders. I think you read my mind. I’ve been wanting to do this ever since I saw an overpriced jar of them at the market. Thanks! This beet talk is reminding me of one of the best salads I had a couple of years ago at a restaurant in SF. It was cooked beets cut into chunks, some chopped red onions, and the beet greens (also cooked) chopped up and mixed into the salad. The combo of the sweet beets and the slightly bitter green tops was wonderful. 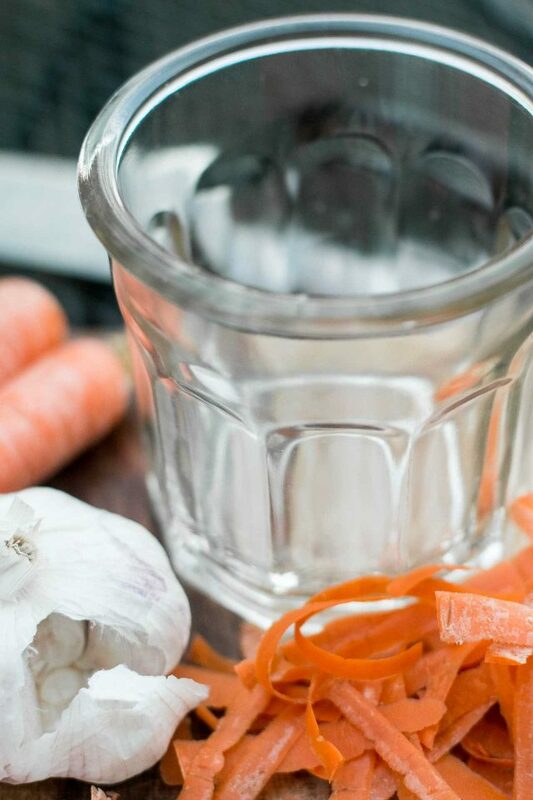 I make this all the time now, using a simple vinaigrette (most of the time with some pressed garlic). btw: I served these with pâté for lunch today and it was a phenomenal combo! 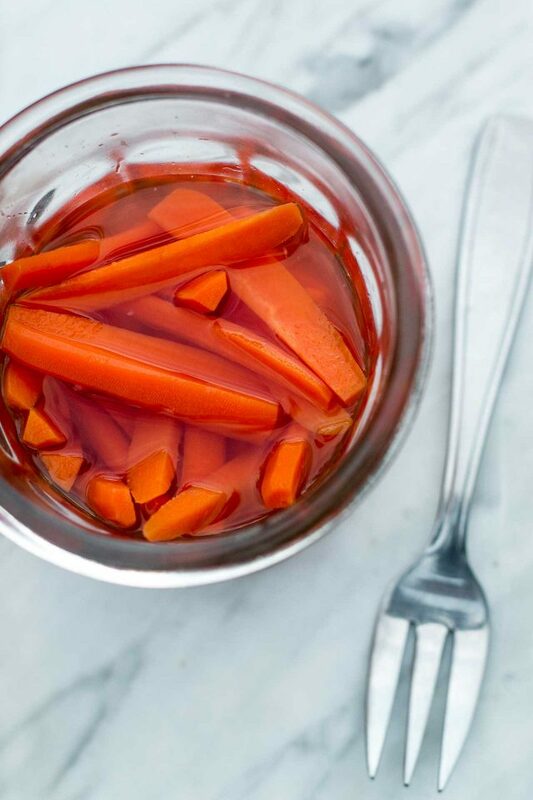 I add carrots to the pickling brine left over when the pickles are gone; after a day or two in the refrigerator the pickled carrots are fabulous. I have to tell you that I made these pickles around Easter, and they have become my new gilded lily. I’ve been serving them alongside cheeses, dips, sandwiches, and they just make every plate look so damn pretty. I threw a few star anise into the brine, which makes the jar look like it’s full of sea life, and it gives the carrots a little shoulder-roll. Thanks for the spectacular site. I’ve made a number of other things, including the Altoid Brownies, and everything has rocked.